Files with agr suffix can be mostly found as vector graphics created using the APM Graph Editing tool. File extension agr is mainly known to be associated with APM Graph computer-aided design system for Microsoft Windows operating system. This type of .agr file contains vector graphics created in the APM Graph editing tool. APM Graph is intended for performance of the graphical part of the computer-aided preparation of design documents. It is an integral part of the APM WinMachine system, but it can be used independently. 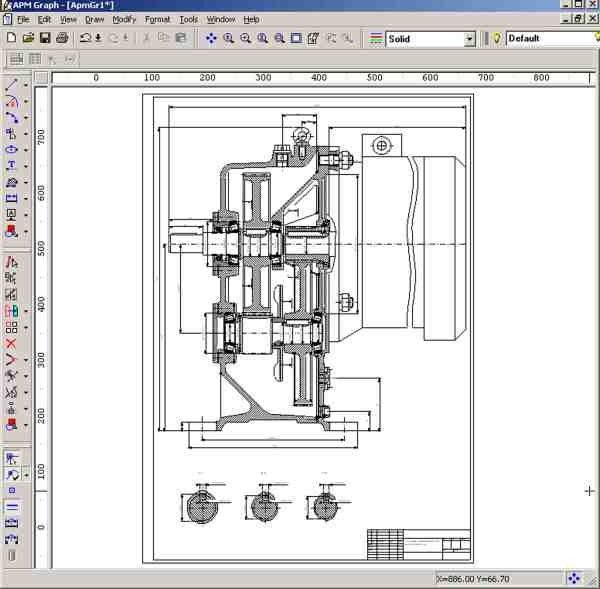 APM Graph represents a 2D graphics editor, which can be successfully used to design a graphical part of design documents in different engineering field, science, architecture and construction. Use APM Graph to open and work with .agr vector graphic files. Possibly can be exporte to some other vector graphic format. Programs supporting the exension agr on the main platforms Windows, Mac, Linux or mobile. Click on the link to get more information about APM Graph for open agr file action. Programs supporting the exension agr on the main platforms Windows, Mac, Linux or mobile. Click on the link to get more information about APM Graph for edit agr file action. Programs supporting the exension agr on the main platforms Windows, Mac, Linux or mobile. Click on the link to get more information about APM Graph for view agr file action. Programs supporting the exension agr on the main platforms Windows, Mac, Linux or mobile. Click on the link to get more information about APM Graph for create agr file action.